A versatile and durable roofing material, modified bitumen roofing is a popular choice for many building owners. If you need modified bitumen roofing in Fort Worth, TX or Dallas, TX, call Roofworx at 817-920-5974! Sometimes called modbit, modified bitumen roofing is widely used for commercial flat roofs. It blends the materials of built-up roofing with the installation techniques of membrane roofing, providing a durable, asphalt membrane. It can be installed in multiple ways, including fully adhered or mechanically fastened. Modbit is also available in single- or multi-ply systems, so you can choose the best system for your needs and budget. With a reliable track record, you can count on modified bitumen roofing to protect your roof from rain, fire, hail, and high winds. 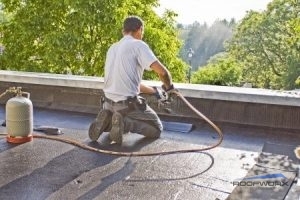 On average, modified bitumen roofs last about 20 years or more with proper maintenance. One key feature of a modified bitumen roof is the top coating of asphalt granules. This protects your roof from harmful UV damage and improves durability. If ponding water or other issues wear away this coating, the roof below can sustain damage. As with any flat commercial roof, proper installation is essential. Shoddy workmanship can lead to poor water drainage, faulty seams, and other problems. When you need modified bitumen roofing in Fort Worth, TX or Dallas, TX, choose the qualified team at Roofworx! We will work carefully to ensure proper installation.We care about the safety of our customers and integrity of your roof, so you will never find us cutting corners! At Roofworx, our experienced contractors know the importance of finding a cost-effective roofing solution for your building. Whether you own a warehouse, apartment building, or retail and office space, the integrity of your roof is essential. Keep tenants happy with a good investment in a quality roof system from Roofworx. From energy efficient solutions to highly durable roof coatings, we make sure your roof is ready for anything. Give our commercial roofing company a call today at 817-920-5974 for modified bitumen roofing in Fort Worth, TX and Dallas, TX! Updated on March 28, 2017 at 7:36 pm by Roofworx & General Contracting.